Oral or oropharyngeal tumors degrade patients’ speech quality because of their location. The treatment of these cancers also affects the functional outcomes, depending on type (surgery, radiotherapy, chemotherapy), volume resection (according the size of the tumor) or on the anatomical area treated, and the post-treatment delay. 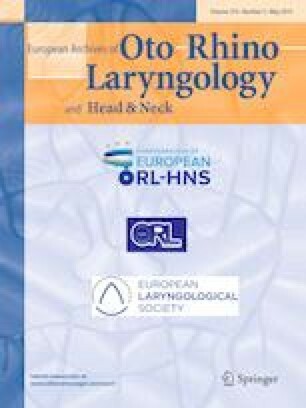 The aim of this work is to determine the factors influencing the chronic speech disorders (in terms of intelligibility and severity) of patients treated for an oral or oropharyngeal cancer. Speech-perceptive assessment was led by a panel of six expert speech therapists, on a task of a description of a picture, presented to 87 patients. Clinical and treatment data were gathered by examining medical files. Intelligibility and severity scores in our population were 6.06 (interquartile range 4.2–8) and 7.61 (interquartile range 6.8–9.5) on a maximum of 10. After adjusting for age and anatomical region involved, multivariate analysis showed a principal impact of surgery on both intelligibility and severity, while the size of the tumor significantly affected the intelligibility score [− 143; 95% CI (− 2.21, − 0.65)]. These results are consistent with the definitions of intelligibility and severity of speech disorders. The lack of information on the impact of tumor location, however, requires more work to contribute to reducing impact on the quality of life of patients. This study was funded by the INCa (Institut National du Cancer – Cancer National Institute) for the C2SI (Carcinologic Speech Severity Index) project (Grant INCa SHS n°2015 − 135).